Cost: Price starts from £5.50 per session per pupil, but this will vary based on additional costs such as school letting fee etc. After School EKO Clubs run weekly on your school site and are open to year groups, key stages or the whole school. An EKO leader will come to your school and give a short powerpoint presentation to your pupils at the start of term and then all bookings and payments are made on-line via the EKO website thereby minimising the impact on your busy office staff. Parents pay for half a term at a time to keep the cost down for families and all invoicing is done by EKO. Pupil premium pupils can sign up and then EKO will invoice the school. Registers are given to school before the start of the first session. 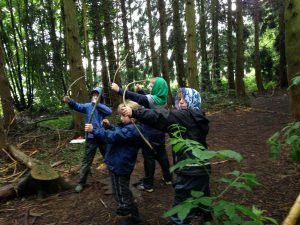 EKO Club sessions are planned, resourced, risk assessed and led by an EKO leader who is DBS checked, outdoor paediatric first aid qualified and has the appropriate experience to ensure fun, safe outdoor sessions each week. The sessions take place on your school site and we can help you to develop your site as required. To run each session we require a parent volunteer or school staff member to support the activities with us and we offer parent volunteers a free place for their child when they assist. EKO Club gives pupils the freedom and flexibility to have fun and relax, yet reinforces the learning that takes place at school. If you wish, we can link our sessions to particular topics or themes that are currently taking place in school, or we can offer a complete contrast, depending on what you require and your pupils respond to. 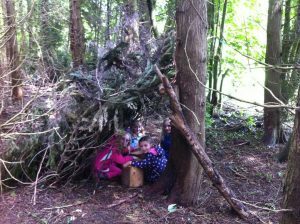 Similarly to our school sessions, activities could include: team games, bug hunting, fire lighting, den building, creating bug house, designing natural art, music in nature, bird identification, plant life cycles, treasure hunts, clay modelling, nature study, natural paints and other seasonal and location dependant activities. 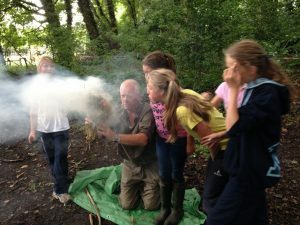 The final session of term is always a ‘family campfire’ to which the immediate family members of the EKO Club pupils are invited to come and join us around the campfire, toasting marshmallows, exploring the site, singing campfire songs and celebrating the fun and learning that has been going on throughout the term. This is a great way to share your outdoor learning vision with your families. EKO has all the necessary equipment, experience, parental paperwork, insurance, DBS checks and health & safety procedures to ensure a fun and fulfilling experience for all. All children must provide their own weather appropriate, waterproof clothing and footwear but we can provide spares if required.